Sub-standard contractors can leave your lawn looking shabby and unkempt when mowing is performed on an irregular or erratic schedule. Improper lawn maintenance can also allow for insect damage and unsightly weeds. During the winter months, Northeast Ohio can go from clear skies to several inches of snow in a few short hours. Snow that hasn’t been quickly removed can turn parking lots into ice rinks. When people and cars start slipping and sliding, exposure to building and property management increases due to higher risk of injury on the property. The last thing a Facility Manager wants is for a tenant or employee to be injured because of an unsafe lot. As with lawn care, substandard snow and ice removal contractors are unprepared when the white stuff starts falling. Tired of disorganized, haphazard, and unresponsive landscape and snow management services? It’s time to contact a reputable, responsive landscape and snow and ice management company. Here’s how partnering with a professional outdoor grounds maintenance contractor can solve your facility management headaches. A well-trained, organized, and responsive, professional turf service company will provide a number of different services to keep your grounds looking picture-perfect. Basic landscaping - Whether it’s grass cutting, tree pruning, spring and fall clean up, or weed control, professional landscaping services will work proactively to keep your grounds neat and well-maintained. Additional landscaping - Landscaping service isn’t only about grass cutting. It should also include services like annual plantings, mulching, plant care (insecticide and fungicide), tree removal, stump grinding, and turf renovation. Weather watch and communication - Your snow & ice management company should always be aware of incoming inclement weather conditions, and be ready to react. Whether by monitoring weather reports, mobile snow patrols, or GPS routing, snow & ice removal should be the main priority of your service. 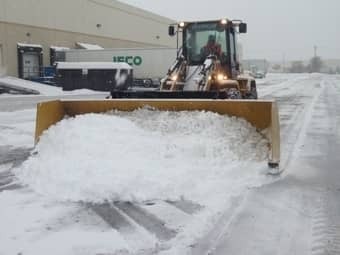 Proactive measures - Snow removal companies should be working proactively to reduce safety and convenience hazards by pre-treating lots and roads, strategically placing bulk salt storage, or using pre-calibrated salt spreaders designed for your property. Sidewalk de-icing and shoveling - Walks and entries are just as important as lots and roads. A professional snow and ice management company will maintain these vital areas to ensure they are clear and safe during a snow event. On-site salt containers should also be available for continued clearing of walks and entries. If you’re not happy with your current landscaping and snow removal service, Turfscape, Inc. can help. Our landscape and snow removal professionals are armed with the highest quality mowers, tractors, snow plows, and salt spreaders. We will make the maintenance of your property’s outdoor grounds our first priority. If you’re ready for high-quality, timely, proactive, and professional lawn maintenance and snow & ice removal services, then why not contact us here at Turfscape? Your property will thank you!